Charles and Emmanuel Fourny, fifth generation at the head of this small house in Vertus, have perfectly mastered their subject. There is, of course, the Clos du Faubourg Notre Dame, monopoly of the family and pampered as it should be, but there is above all a range of wines with ethereal style, precise and perfectly carved. For this level of excellence, sustained for some years now, and for such a graceful vision of CHampagne, we have given the domaine a second star this year. The wines : The range has seduced us with its homogeneity. 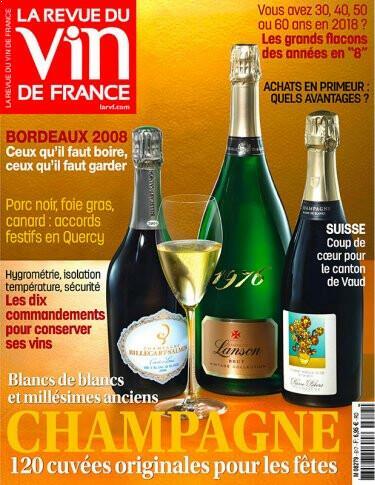 As a wine-growing region that has no equal, Champagne only gives the possibility to taste vins clairs in the spring. Here we therfore accept giving an initital indication of the quality of upcoming wines. Synonymous with festice occasions by their liveliness, champagnes are often drunk in the prime of their youth. However, the best champagnes are also among the best wines for laying down. What is the profile of an Alsace Riesling, a Cahors Malbec, a Sauternes Semillon, a Côte-Rôtie Shiraz, a Moulin-à-Vent Gamay? in order to guide lovers wine lovers through the learning process, our tasters have selected wines repreenting each region. This small family house in Vertus produces, with great precision, a particularly sleek brut which makes up 40% of the reserve wines matured in barrels and which bring out the sublte bubble and mouth-watering length on the palate. At this price it has established itself as a must among champagnes. A very successful «white» Champagne. A rare sparkling depth for the Vertus Chardonnay. Excellent value for money. Resounding final, en finesse, full of finesse, for this old vine chardonnay which provides a gracious and mineral interpratation for a vintage too often considered sweet.